Resources is a place to store documents, files, web links and other learning objects. Every site can have Resources enabled. Use the site Resources tool to make various types of materials available to your students. This is over and above the materials that you provide to your students in your lessons, under Modules. Examples of the types of resources you can create/upload are documents (e.g., text documents, spreadsheets, slide presentations, etc. ), links to other websites, and simple text documents that display right on the page. You can upload up to 10 resources at a time. You can create folders to organize your resources, and you can create HTML documents. TIP: Resources may include any supplementary resources, media files, documents, and links to web pages that may be of interest to students and add value to a course. When your site is first created, you will have one resource folder that uses your site’s title. Everything you upload as a resource will end up in this folder. If you have just a few files, you may want to put everything into this one folder. 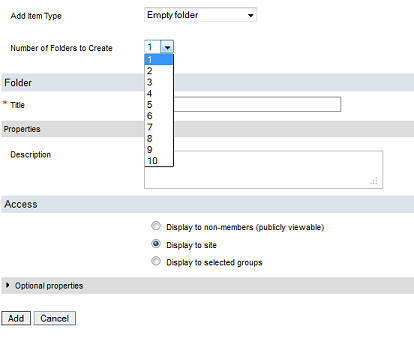 If you have many files to upload, you may wish to organize your files further into individual folders that are themselves located under the original site resource folder. If you want to organize resources into folders, you should create the folders before you upload/create resources into them. Important: Do not include spaces in the folder names. Also, the names of the files that you upload should have no spaces and only alpha-numeric characters. Please take the time to revise the filenames of your materials to comply with the latter requirements prior to uploading. Enter the Resource area by clicking on Resources in the left menu bar. Click on the Add link to the right of your main resource folder. From the pop-down list, choose a resource type: local file, empty folder, URL, new plain text document, or new HTML document. The Optional Properties arrow allows you to include a lot of information about the folder you’re adding, but these properties are not required, and in the case of an empty folder, probably add nothing useful. In our example, don’t bother to access these features. You will be returned to the “Main List” of Site Resources. Notice that your new folders show up, along with Edit properties | Folder Permissions | Add links. To put files into these folders, click the Add link to the right of the folder title. For each file, browse to find the file on your computer to upload. Be sure the file has an appropriate extension (.gif, .doc, .html, .jpg, etc.) or it may not open correctly on the user’s computer. Also, be sure that the filename has no spaces or invalid characters (alpha-numeric only). Choose a Copyright Status. This field is required. Then, if desired, fill in copyright information and check if you want the copyright alert to be displayed to users when they download the file. Choose if you want an email to go to your site participants notifying them of the added resource. If you want to put in more identifying details about the file, click on the Optional Properties arrow to access those fields. Included are fields for Date Created, Date Issued, Abstract, Audience, and more. Select the number of web site links to add (1-10). Type in the URL. Remember to include the http:// prefix. Give the web page link a title (required) and description (optional). Choose if you want the public to be able to see the resource or not. Choose if you want an email notification to go to your enrolled students. Click the Add button to upload the resource, or Cancel to not upload. Type the document content into the upper box. Note that this option doesn’t allow you to format your text. It will just be a plain, vanilla block of words. If you want to make your words look better, use the HTML option. Give the document a title (required) and description (optional). 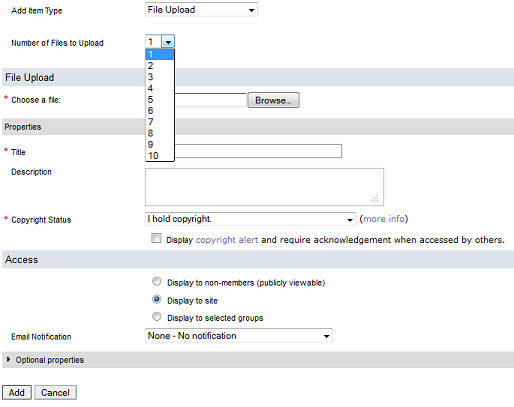 Choose a Copyright Status (required) and add any copyright information you want to include (optional). Type the content into the appropriate box. Use the built-in editor to format your text using the supplied toolbar. If you’re using an unsupported browser, such as Safari, you will not be able to use this feature. After uploading a resource, you will be returned to the Resources page. The new resource will be listed with any others you have already uploaded. The resources list can be sorted by clicking on the desired column title. If it is sorted A-Z and you prefer Z-A, click on the little pyramid shape next to the column title. In the resource list, click to put a checkmark next to the resource you want to delete. Click on the Removed Checked button at the top of the page. Confirm that you want to delete by clicking Remove or change your mind by clicking Cancel. If you have created a resource but it didn’t end up in the desired folder, you can easily move it into the desired location. You can also copy a resource in the same method. If necessary, create a new folder to move something into if it doesn’t already exist. In the list of resources, check in the box next to one or more items that you want to move. Click the Move Checked or Copy Checked button at the top of the window. 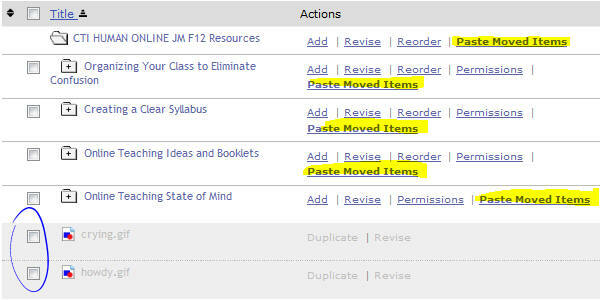 b) any folders now have Paste Moved (Copied) Items links to the right of them. Simply click on the Paste Moved (Copied) Items link for whichever folder you want to move the items into. Please don’t alter permissions in any tools, unless you understand what you are doing. You can lock yourself out of options (the ability to do things) if you remove permissions from the instructor role, example. Students have “access” privileges, so by default they can just view resources, but they can’t add resources and they can’t revise any, either. In most cases, the default permissions are exactly what you want to have assigned. If you change the permissions of a role in the Resources of one site, it does not affect other sites. Changing the permissions of a specific role (say, allowing the ‘student’ role to add resources to your site) in your Resources tool will give the privileges to all the site participants with that role.